Remember the Tariff Change at the end of March, when Royal Mail suddenly realised that they really ought to keep the 97p postcard and basic Worldwide letter rate? 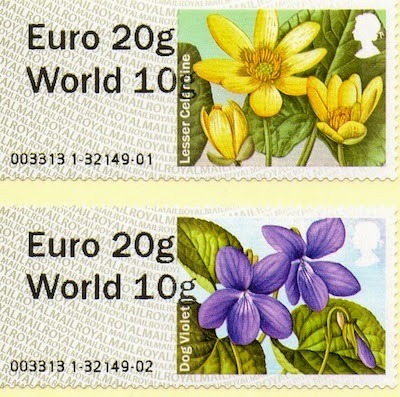 Emergency measures were taken with Post and Go machines and, after a false promise of a nationwide change in April, the NCR software was changed in June so that the 'Europe up to 20g' stamp was changed to read 'Euro 20g / World 10g'. The special machines in use at philatelic events, and at the BPMA and NMRN also used this service indicator. Those of us who thought about it generally reckoned that with the Wincor-Nixdorf machines being replaced rapidly their software would not be changed. 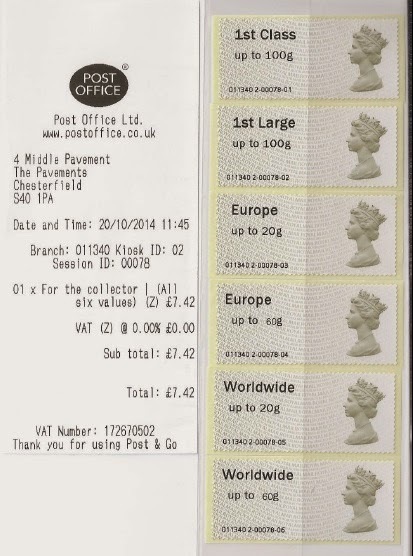 The Philatelic Bulletin (October p 55) confirmed that "The dual-value label was not vended from Wincor machines." From machine number 1, so clearly not an NCR machine. In fact, Spring Blooms from Chester-le-Street's Wincor-Nixdorf machine! We await with bated breath your reports of availability on other stamps. Brown Machins (various dates), Union Flag (also various dates), Symbolic Flowers, and possibly some of the older stock if any of it is left in Post Office branches yet to be converted. * Update: the same seller now also has the new Poppy stamp with this change, despite assertions elsewhere that this would not be provided to Wincor-Nixdorf offices. The Collectors Set shows clearly how the new caption is out of step with he others which were changed earlier in the year. 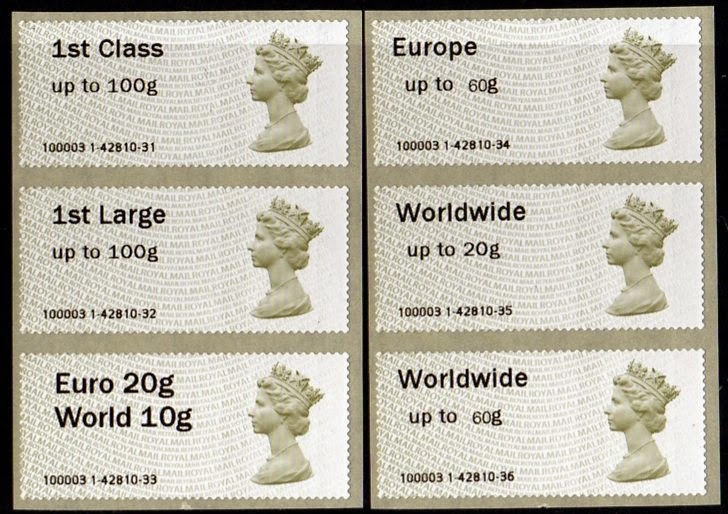 The 60g stamps still have the 'wrong' size figures which means that there are three different types in one set! Iain reports having bought Symbolic Flowers and Freshwater Rivers, but I don't know which offices these came from. This error has since been rectified. As a result of advice from readers (many thanks all) I visited Kidderminster on Sunday and secured some Machin MA13 versions from their Wincor-Nixdorf machine. No other Faststamps were available because all old stock was returned to store when the Crown House post office closed and operations moved to the WHSmith shop in Vicars Street, about 100 yards away. Meanwhile, as reported in the comments, Macclesfield's WN machine has been removed and is not being replaced. Fortunately Stuart managed to get me some Pigs and these (with the Machin above) will soon be in our webshop. In its last 2 weeks Macclesfield was using up old stocks which included all of the Farm Animals and at least two of the Freshwater Life sets. (1) Further conversions to NCR have now reduced Wincor in the Capital to a handful. Wood Green has been NCR for some time and recent conversions are Great Portland Street and Junction Road. Kensington (of poppy fame) has had Wincor withdrawn so NCR is imminent there. I am sure it is not official but from today's observations it seems if a Wincor goes defective it is not been given priority for repair with Farringdon Road and also 2 of the 3 kiosks out of service at both Tudor Street and Clapham out of service. The kiosk at Holloway is showing a Windows start up fault as it did two weeks ago, not checked were Finchley Road and Balham. (2) I'm reliably informed that Harrogate W-N machines were removed this week (16 October) and York will be changed on 30 October. (3) London's Baker Street's 2 W-N machines were withdrawn on 21 October. (4) Sevenoaks NCR went live 31 October; Macclesfield W-N removed 31 October and not replaced; Leeds W-N removed 27 October; York W-N last day was 25 October. I'm trying to get up to date information from Post Office Ltd.
Dual value new font available at Baker Street on Spring Blooms and at Farringdon Road on undated Machins. Tudor street also had undated Machins in the 2 kiosks which were working, but I did not check the font due to duplication with Farringdon Road. Just to complete my venture into London, Great Portland Street had MA14 Machins, both 1st and 2nd in all it's NCR kiosks, Aldwych had Poppies in it's NCR kiosks 1 and 4 (not sure about kiosks 2 and 3), and I can confirm that the BPMA's Machin and Union Flag stamps are undated. At least this change was needed rather than overcharge customers sending anything 10 grams or under. Frankie G - Baker Street's 2 Wincor machines were withdrawn on Tuesday. NCR's imminent. Oops forgot Symbolic Flowers at Balham and Machin (undated) at Swiss cottage. Aberystwyth , Balham, Chester Le Street, Macclesfield. The WHSmith Retail operated branches, despite being classed as main branches, only get Machins as a rule, occasionally getting pictorial ones. In theory Sutton High Street (014013), which is due to close on the 8th November and Brazennose in Manchester which is due to close on 14th November due to relocation. Markets Branch at Leeds, last day of use is Tuesday the 28th. Only 1 machine working, Union Flag in it this lunch time. Thanks for all these extra notes, it seems like Wincor-Nixdorf is rapidly disappearing! Could you say whether Kidderninster is NCR or WN please, don't want to waste my time! Converted to NCR about 3 months ago. Has Sunderland been converted yet? were expecting to move them to a different position and they were expecting one more . Monday 27th October - Tudor Street (Ludgate Circus) still has the Wincor but only machines No.3 and No.4 working properly. Machine 4 has the Sheep and Machine 3 has undated Machin. Interesting that the background (wavy line) printing on the Machin is more or less invisible resulting in a 'plain white' part of the label. 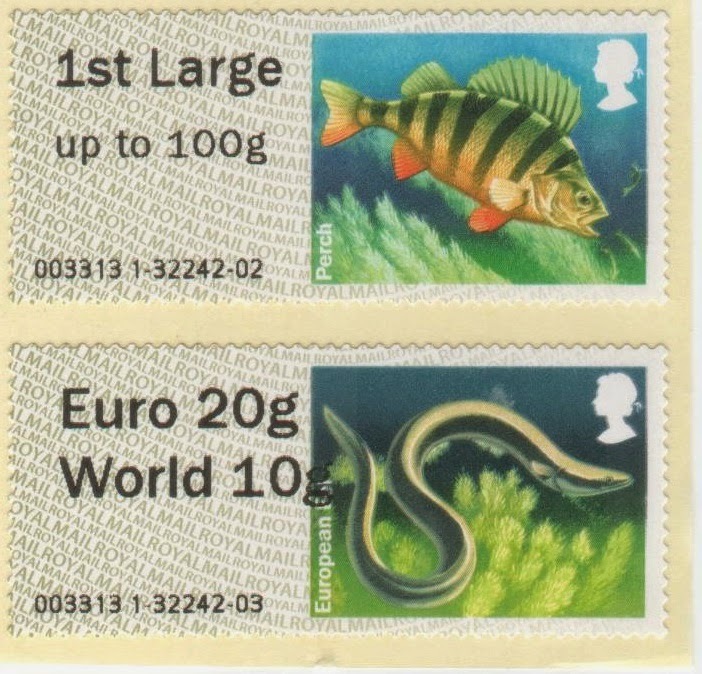 The typeface for the Euro 20g/World 10g as expected prints over the surface of the sheep. At Trafalgar Square the new machines have Machin Year Code 14. Adding to the thread Ipswich (2) and Colchester (4) have been NCR for some time. Guildford with 4 kiosks has converted they are still using up older stock with 67-69 dispensing spring blooms, 70 is poppy. Sutton due to close on the 8th November the kiosk was out of order last Friday so doubt will be repaired now. The only other location I had as Wincor not mentioned above was Sevenoaks but I have not checked there since early June according to my records. Both Sevenoaks and Sutton High Street still have Wincor Machines, but the upgrade has caused problems. Sevenoaks may not be sorted due to NCR conversion, Sutton should be sorted Thursday afternoon (with any luck). Went to Glasgow which I knew had 3 NCR machines which seemed very inadequate as it was extremely busy and queues were very long. Then went to Paisley to be disappointed to find 3 NCR machines there. Was hoping they had not been converted. Last day of Wincor machine at Leeds Markets was YESTERDAY. Man with sledgehammer and screwdriver in the Post Office. NCR machines to be installed and in use from tomorrow. Sevenoaks machines were not working, even though they leave the machines on at night, it never took the new value update, so they switched them off. Clapham has 3 NCR machines, at 13.30 on 29th Oct all 3 machines were out of service waiting for staff approval checkout. There was no staff around and just 2 serving at the counter. All this info with up to 9 machines in some offices,spare a thought for collectors living in Dumfries and Galloway (like me), NO machines in whole of Dumfries and Galloway,NONE to the north in Ayshire,and believe it or not NONE in the whole of Cumbria including Carlisle!. WHY,who ever chooses where machines are located,should go back to the map of Britain. Reading that Trafalgar Square has 9 machines,Iwonder about the distribution of these machines.Living in Dumfries and Galloway,we have NO machines in the whole county,plus NONE to the north in Ayshire,and believe it or not NONE to the south in the whole of Cumbria including Carlisle!. WHY?. Whoever chooses locations for P&GO machines should study a map of Britain!!. Further update to the above Macclesfield has lost Wincor without replacement, Hastings is undated Machin kiosk 2 has missing text on the left hand side giving st Class, p to 100g and part missing branch code and Holloway is still not working with Finchley Road also undated Machin. Can confirm Sevenoaks is now NCR with 3 kiosks that went live Friday. Have Newbury, Fareham & Hyde been changed to NCR? Dorking, Eastleigh, Petersfield, Wokingham, Wigan are NCR. I will add Oswestry and Finsbury Park to the NCR list. I make it more new locations than the 31 stated, I have them as Crouch End, Grantham, Beeston, Leighton Buzzard, Kettering, New St Huddersfield, Honiton, Bexhill, Finsbury Park, St Helens, Brixton, Farnham Road Romford, Harpenden, Stroud, Wokingham, Rotherham, Wigan, Oswestry, Worthing, Dalston, Muswell Hill, Chorley, Bournemouth, Cirencester, Lowestoft, Poplar, Bridgend, Sutton, Harbourne, Sydenham, Roseberry Avenue, Wrexham, South Woodford, Islington, Hoddesdon, Eastleigh and Petersfield. Dorchester is following Macclesfield. The kiosk goes next week. Currently out of action. (4) Machine working, however you can’t pay as the card reader is jammed, so you can’t use it. I am looking for some help identifying an NCR location the office code is 402511 which is a 1 counter sub post office at Rooksbridge near Axminster so this is obviously not correct. It must be a larger office as it is from kiosk 72 and the session number is 1985, does anyone know the correct location which must be in the West Country. The 402511 branch ID is used by NCR during development and testing of the SSK. The particular session number, 1985, indicates that you've got a test label that is usually printed during initial testing and set-up of new kiosks. Farringdon Road last night (7 November) had Machins with the 3 font anomaly as in the blog picture. I don't usually collect font differences and stick to different underprints but this was too good to resist on my way back from the BPMA for their poppies. Almost like a farewell souvenir to the old machines with the added bonus of a noticeably odd set of fonts. Interestingly no-one was using the machine despite a long queue for the counters (about 4.30pm). I hadn't used a WN for many months and found it basic and clunky and got stuck on the basket page without being able to go to pay directly so had to start again. Also no pictures to show what you're getting. The new machines are definitely a big improvement. Baker Streets 2 Wincors have been replaced with 4 NCR Machines. The Post office have announced that the offices at Breck Road (Liverpool), East Dulwich (London), Holywell, Llangefni, Matlock, Melksham, Morriston (Swansea), Old Swan (Liverpool), Port Talbot, Raynes Park (London), Stornoway and Willenhall will remain Crown Post Offices, and will be modernised. Some or all will get NCR self service machines. The Post office has finally update their branch finder, it show that Andover, Eccleston St (London), Kilburn (London), Longton (Stoke on Trent), Pudsey, Southall (London), Stamford, Wakefield, & Walworth Road (London) now have Post & Go Self-Service machines.